This means the coffee contained in this package has been carefully cup-tested by the Coffee Industry Board of Jamaica, and subsequently granted the prestigious certification of 100% Jamaica Blue Mountain® coffee. Don’t be fooled by the words: “Jamaica Blue Mountain”, “Jamaica Blue Mountain Blend” or “100% Blue Mountain”. If the coffee package does not have the “100% JAMAICA BLUE MOUNTAIN®” logo seal authorized by the Coffee Industry Board of Jamaica, you are NOT drinking coffee that meets the standard for certification. 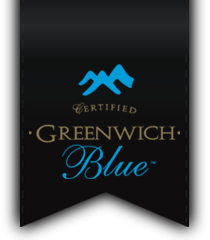 *Each Greenwich Blue package contains its own certificate of authenticity. What type of coffee plant do we grow on our estate? - We grow the “ORIGINAL” Arabica Typica Coffee Berries brought from Ethiopia hundreds of years ago. It is very expensive to grow but we grow it for its “Exceptional” taste and cup quality. ***Our green coffee beans are also bought by roasters all over the world to upgrade and enhance the taste of their own coffee.